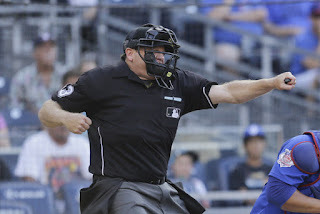 The baseball season has started up and fans are thrilled by the bunting and the umpires who have spent the entire winter brushing up on their HRAAAAANNNNTTTT strike bellows and the possibilities of World Series glory for the approximately eight professional baseball teams interested in winning games. The baseball offseason is usually marked by a flurry of free agent signings and trades, but this winter featured a horrible months-long tedium where teams remained frozen in their tracks and all-star-caliber players found themselves in the curious position of having no teams willing to pay them large sums of money. For baseball fans hoping their team would snag a player on the open market, the entire thing played out like the ending of The Good, The Bad, and the Ugly if Sergio Leone had just continued to cut to increasingly narrow pictures of Clint Eastwood, Eli Wallach, and Lee Van Cleef squinting at each other for three solid months while a mournful harmonica played an Ennio Morricone piece entitled "Boras's Lament." chart that said in tiny type in the bottom "ok shoot now"
And yet, even as the baseball diehards outside of internet comment sections where the prevailing ethos seems to be that baseball players should play for free or at the very least haul some sacks of coal around on off days and also why don't they have guys named "Pinwheel" and "Squeaks" anymore complained at the endless days of constipated transaction lines, this offseason provided the most grim and depressing result of analytically-inclined writers attacking free agency as a sucker's game and the triumph of teams that have tanked their way to October glory. Over the past two decades, we've seen sophisticated statistical analysis break through to the mainstream, to emerge from the Proverbial Mother's Basement fully formed, suited, and hair-slicked, to the Sloan Conferences of the world to expound on Assets. We can all agree that this is for the best, that the fact that sports analysis is no longer primarily done via amateur phrenology by columnists who guard against retaliation by wearing hats. The fact, though, is that the type of salary inefficiency championed in Moneyball and in fantasy sports all results in finding ways for organizations to figure out how to spend less money. In baseball, this means taking advantage of a bizarre inverted salary structure where teams' competition for top free agents often means paying them into their graying years. This year, teams have found that they could stop paying for players' descent into overpaid chumps by not competing for their services at all. They also figured out that they could avoid paying competent major leaguers in favor of young and unproven players because they can either convince fans it's part of a long-term tank and rebuilding plan or, in the case of the Marlins, get rid of all of their good players and pay only to emblazon their taxpayer-funded ballpark with their new team motto Who's Going to Stop Me? 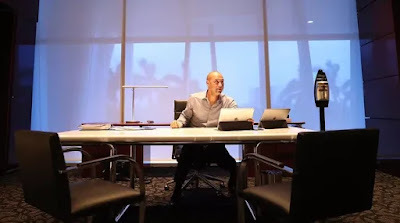 ownership group as shown from his new office's decorative scheme "Volcano Overlord"
The salary efficiency mindset has spread well beyond baseball. NBA players might as well have their salary on the backs of their jersey because the league's insane salary cap and labyrinthine trade rules make their paychecks vital aspects of player movement. These rules are impenetrable to all but a select number of professional Salary Cap Knowers and podcasters that pretty much spend hours listing how much money everyone makes. The prevailing wisdom in the NBA is that teams should either be one of the three or four championship contenders in a full-on free-fall for draft lottery ping pong balls; therefore a full third of the NBA has been actively trying to lose games for months. Regardless of anyone's thoughts on The Process or the dozen Counterfeit Processes currently ongoing in professional basketball, the owners have finally found a way to fill their arenas with low-paid basketball excrement while being celebrated for being forward-looking because they are starting four heretofore unknown centers named Phil Lumberman and Miroslav Oaf so they will have a two percent greater chance to pick a nineteen year-old. The NFL also has a salary cap, but it is aided by players signing inscrutable contracts that allow them to be cut or restructured so often that it is impossible to tell whether the cap exists; I have never seen the national football league enforce the salary cap, and I suspect that if they tried to do it to the Dallas Cowboys, Jerry Jones would threaten to shoot them with a pearl-handled revolver. The Cubs remain in the enviable position of baseball's teams trying to win. They brought back nearly every key player from last year's NLCS team except for Jake Arrieta, who has now joined the Phillies after a long offseason in limbo. Instead, the Cubs shelled out for Yu Darvish, fresh from a disastrous World Series and a career of being what highly technical baseball analysis would describe as insanely cool. Darvish has been one of baseball's best pitchers and slots in with Jon Lester, Jose Quintana, Tyler "Spin Rate" Chatwood whom the Cubs hope can salvage his career away from Coors Field, and Kyle Hendricks, who continues to dorkishly bamboozle major league hitters to form a fearsome rotation. Every year brings a new update on Jon Lester's various attempts to conquer his fear of throwing to first, which has previously included underhanding, running the ball over, throwing his whole dang glove, attempting to hire a courier, and finally standing at the mound saying "I prefer not to." Lester is now divebombing his throws into the ground like a cricket bowler. This has already worked against Ryan Braun's stealing technique of sort of walking around, and I look forward to seeing how Lester plans to throw to bases next including building a miniature bullpen car for shuttling the ball or constructing an elaborate rube goldberg machine that draws the ire of the ump after he calls time for 25 minutes to figure out why the dowel connected to the boot that kicks over the row of dominoes and activates the third conveyor belt has malfunctioned. The other major change for the Cubs this season involves Chicago's Beefy Boy Kyle Schwarber reporting to spring training svelte, muscular, and having a patchy beard instead of a hideous chin goatee that looks like he is trying to make do with a child's Civil War General Facial Hair Kit. This may or may not help Schwarber's hitting or prevent him from lumbering about the outfield like an anthropomorphic thumb. Aesthetically, it is a complete disaster. The robust lefty-slugger who waddles over to home plate to blast enormous dingers and make cartoon coconut noises while stomping around the basepaths is a proven baseball archetype. The best exemplar is Matt Stairs, a man who spent years summoned to the batter's box once a game from flipping burgers on a grill to launch a baseball into low earth orbit. 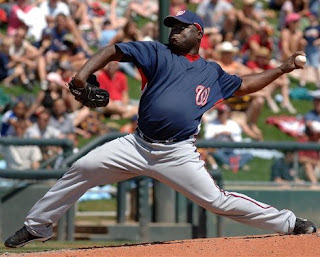 The only other perfect baseball shape is the relief pitcher who is just a load, his undulating belly straining against his baseball pajamas or satin pitcher's jacket. There is little to say about the Cubs, a very good baseball team who should be very good. They have made the NLCS three consecutive years, they won a World Series and ended the greatest championship drought in American professional sports, they play in an outdoor mini-mall that turns into a terrifying festival of drunken maniacs like what happens at night in Castlevania II, and they compete in a division that is competitive because it features three teams that took advantage of baseball's free agent market and the Great Marlins Exile. After years of futility and heartbreak, the best extended stretch of Cubs baseball since the Theodore Roosevelt presidency is also its least compelling. It would take an unforeseen baseball calamity to bring back the fear of inevitability back to Wrigley Field, one that would probably require at least two players to duel, to vanish into thin air, or to get attacked by a wild animal in the course of a playoff game for me to even flinch. One of the famous hoboes who made Duncan's place [that's Bob Duncan, King of the Pickpockets] their Chicago headquarters was Wyoming Slivers, who left the road about 1896 and married a widow in Minnesota. She died after a few years and left him ten thousand dollars, and Slivers and a score of his cronies went on a six months' spree in which ten of them died of delirium tremens and Slivers himself lost an ear and three fingers in fights. One might think that a book on the Chicago underworld would spend a great deal if time on the city's most famous gangster Al Capone, but Asbury only turns his attention to him, his boss Johnny Torrio, and a host of "such notorious gunmen and bandits as Handsome Dan McCarthy, Bugs Moran, Maxie Eisen, Frank Gusenburg; Vincent Drucci, better known as the Schemer; Two-Gun Louis Alterie, also called the Cowboy Gunman because he owned a ranch in Colorado; Hymie Weiss, who was O'Bannion's alter ego and second in command of the gang; and Samuel J. Morton, called Nails..." towards the end of the book. Gem of the Prairie is nearly 400 pages of that. 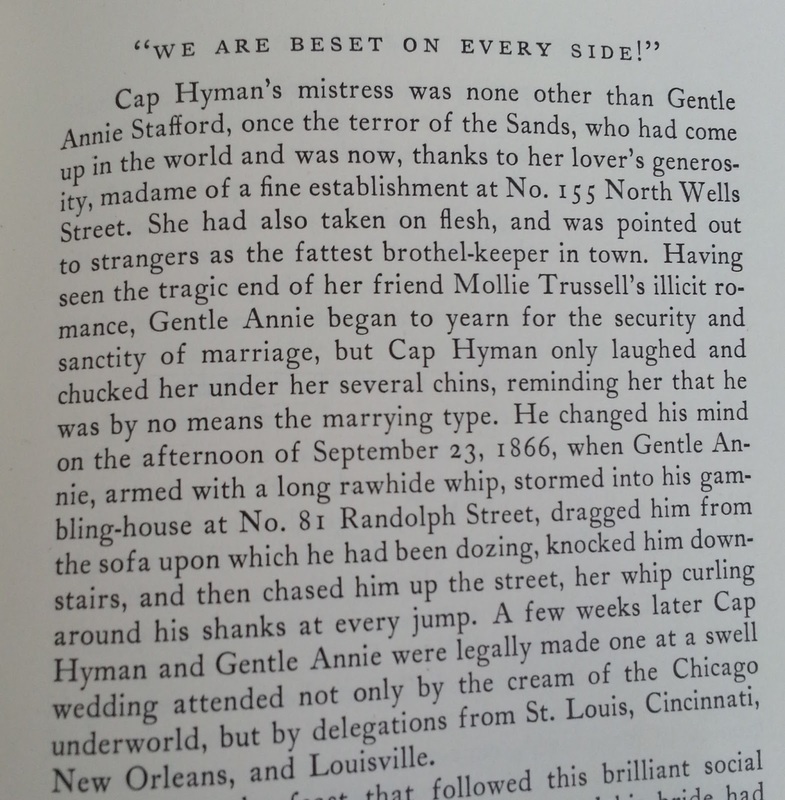 Asbury seems to have done extensive research in newspapers, government documents, journals, and books such as Vice in Chicago written by a person improbably named "Walter C. Reckless." But this is not a stolid, scholarly document. Asbury provides statistics and analysis, but what he's most interested in is the anecdote, the improbable characters, and the over-the-top criminals, politicians, and law enforcement figures that populate the book. It's also written in 1940, which passages and assumptions that will probably at times jar a reader in 2018. 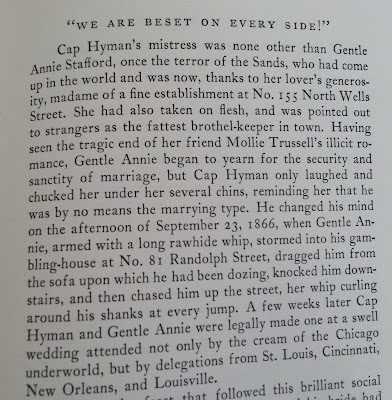 The most fascinating thing about Gem of the Prairie is its evocation of a city with all of the dirt and grime and swirling possibility of shockingly casual violence and exploitation he seeks to paint a horrifying picture for his readers but he can't help but also romanticize. Northwestern has had basketball disappointments-- heartbreakingly close losses to miss the NCAA tournament, falling victim to NIT bracketology, having Big Ten championship celebrations derailed by grim tidings from the League of Nations-- but the Wildcats have never had a disappointing season because most Northwestern seasons were considered successful if they played a regulation game without the opposing team bulldozing the arena into a pile of rubble. The Wildcats entered the season with all the swagger and confidence of a Defending NCAA Tournament Participant. The Associated Press, which was so bamboozled by Northwestern's improvement last year that they could not find a Northwestern logo for their website, ranked Northwestern to start the season. With all but one returning starter, the Wildcats seemed like a decent bet to make the Tournament again, to rack up RPIs and Ken Poms, to continue collecting the ire of college basketball fans who were sick of Michael Wilbon's face. This marked the first season where the NCAA Tournament did not seem like a distant hope or a ludicrous dream, but something to prepare for, that fans could get one of those giant maps and tiny tanks and the tank-pushing sticks and use it to figure out which games they could win and lose before triumphantly arriving in some regional. Instead, Northwestern struggled all season and floundered their way out of the NCAA tournament, the NIT, and possibly even one of those disreputable fly-by-nite tournaments that are constantly derailed by disputes about whether there're any rules what say a dog can't play basketball. The purple 'Cats were stomped into wine by Texas Tech, buzzer-beaten by Georgia Tech, and NBA Jammed by Trae Young. They barely survived overtime against their two crappy in-state rivals DePaul and Illinois. The Michigan State game involved them racing to a 27 point lead against the conference champions and then slowly sinking into quicksand for the entire second half, a loss so painful and needlessly cruel that Chris Collins turned into a cartoon character. People following this team have spent all season trying to figure out how the Wildcats fell from an NCAA Tournament team to sweating out losses against the likes of Rutgers and Iowa. They did lose two players, most notably Sanjay Lumpkin, the anchor of their defense, who allowed the team to ride his chest like a burly chariot through Big Ten frontcourts and into and endless conga line of charges. The go-to explanation has involved the team's temporary relocation to the All State Arena located far from campus at the end of an O'Hare runway. This is a satisfying reason because the All State Arena is the sports equivalent of a floating garbage island that should be torn down brick by brick during a brawl between fans of what I imagine as a version of Warrant formed by the drummer and the Warrant formed by the guitarist who in this scenario are suing each other and have formed armies of bellicose supporters that have been tearing up arenas and county fairs for the better part of a decade. 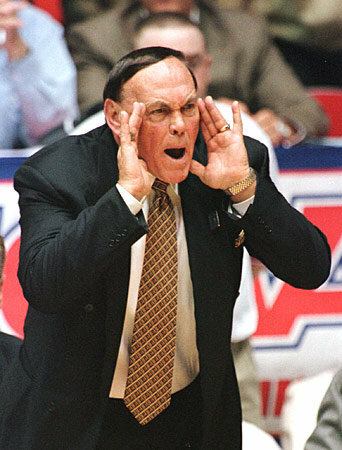 Certain uninformed cretins have maligned the pre-renovation Welsh-Ryan Arena as "an arena where you probably could bet on fighting lizards" or "the lunchroom" but those people are missing the charm of melding into the person next to you in tightly-packed bleachers while sitting close enough to spray pretzel crumbs onto Gene Keady's combover, and I will never like a sports venue more. 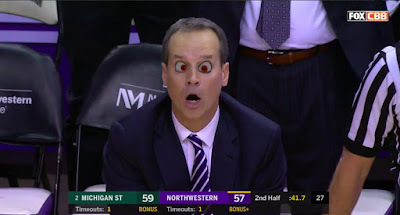 It would be impossible for Northwestern to recapture the giddy ecstasy from last year's run as the tournament became a possibility and then clinched by an impossible sports movie play at the last possible second. It is no easy task to continue to make the tournament in the Big Ten, and harder still without being able to ambush opponents who instinctively view Northwestern jerseys as dunk runways. If Northwestern has fallen from its zenith this season, this same group of players can be celebrated for creating a zenith to fall from. There is a notion that the zone defense is for cowards, a gimmick for overmatched teams that will be instantly vaporized on the dribble, posted up into the stanchion, and relentlessly bullied. This is ridiculous; teams at every level run zone defenses.. But when a team switches, like Northwestern did, from a brutal man-to-man scheme that got them to the tournament to a match-up zone, the move reeks of desperation. For Northwestern fans, though, the zone did not just represent a change in basketball strategy but the aesthetic embrace of Northwestern basketball. Northwestern basketball under Bill Carmody did not involve strategy but an entire ethos. Carmody's teams sought to bamboozle opponents with unorthodox basketball: a ponderous Princeton offense that involved doing backcuts at opponents until they just let them have a layup under then-glacial 35-second shot clock; a bizarre 1-3-1 zone defense that looked like a basketball jellyfish as players lunged and undulated in patterns that opponents had not seen before that forced them to pause before rising up and dunking through them. Carmody basketball hoped to confuse opponents for long enough for Northwestern's less heralded players to get a lead. "Vince played him as well as he could," Tim Doyle said about his center Vince Scott's matchup against Ohio State's Greg Oden in an article with the astonishing title "Cats can't climb Mount Oden." "But Greg is going to the NBA after this season and Vince is going to be an investment banker" is the unofficial motto of Northwestern basketball. The matchup zone used this season is not as aesthetically pleasing as the 1-3-1 zone, with a destroyer like the National Basketball Association's Reggie Hearn terrorizing unwitting guards at the top, and a masked Luka Mirkovic hovering around the free throw line like the Phantom of the Paint. That particular combination represents the platonic ideal of Northwestern basketball, as long as it is run in front of an enormous number of screaming Indiana fans in Welsh-Ryan Arena, under a malfunctioning dot scoreboard. But Collins's zone occasionally produces sublime moments: players dashing around the wing to deny entry passes and stay just in front of players rendered into jabronis foolish enough to drive, frustrated perimeter passing, and the most enjoyable sports sight of all, aggressive pointing. The Wildcats have limped into the Big Ten tournament without Vic Law or Jordan Ash and without a win since February 6. 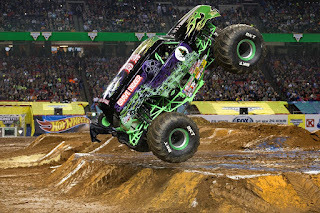 They've already said goodbye to the All-State Arena, which is only weeks away from giving itself over to Grave Digger, SkullHammer, Car-Nivore, and the other monster trucks to jam it beyond recognition. The team faced an impossible task of topping one of the most joyful sports experiences I've ever witnessed. Time did not stop when Pardon hit the layup, the Wildcats did not freeze forever in mid-air when CBS announced they were officially in the Tournament, and the world continued to spin even after Pat Fitzgerald burst into the locker room and baptized the basketball team into his cult of the vigorous first pump. It is strange and almost surreal for a Northwestern basketball season to be disappointing because they did not live up to their preseason top-25 ranking. The Carmody teams that came close enough to knock on the Tournament door or at least make enough noises for the Committee to check and see if it was the wind provided disappointment and heartbreak, but the expectations were never this high. Most of the time, it was impossible to be disappointed by a Northwestern basketball team, provided that they did not break any federal laws. Sure, Northwestern did not storm back through the Big Ten and shatter records on the way to the NCAA Tournament. But this team, with Bryant McIntosh, Scottie Lindsey, and Gavin Skelly who may be playing their final game tonight in the Big Ten Tournament, has already done something I didn't think I'd ever see and changed the entire notion of what is possible for the men's basketball team. Until of course, they run the table in the Big Ten Tournament and find their way back to the Dance. As last year's team proved, anything is possible.